Have you ever considered becoming a foster parent? Do you have a spare room in your home (and heart) to offer an infant, kid, or teen desperately needed shelter and love? If you say nope – never thought about it – you’re hardly alone. Fostering children is not something most adults seek out, no matter how big their hearts, wallets, or good intentions. But oh, how foster families are needed. There are over 400,000 children in foster care in America, removed from families in crisis. Half these children will leave foster care – either reunited with family or adopted (Foster Club). The other half will remain with foster care families or group homes until they ‘age out’ of the system. The outlook for these kids isn’t rosy. Less than 50% of foster youth graduate high school and only 3% graduate college (Kids-alliance.org). Fifty percent of aged out foster youth experience homeless or incarceration. Furthermore, 75% of teen girls in foster care are pregnant by the age of 21, with 40% of these moms’ babies entering foster care themselves (allianceofmoms.org). Here in Los Angeles, there are over 28,000 children in foster care. Many will go to relatives. But the rest are shuffled between government holding centers (converted daycares, sometimes cots in conference rooms), while social workers make dozens – or hundreds – of calls to registered foster families (LA Times). Several factors contribute to this chaotic situation. Well-meaning laws limit the time children can spend in a holding center, forcing staff to shuffle them from center to center until a family can be located. Furthermore, the county lacks a real-time database of foster home vacancies, hence the frantic calling. There’s just not enough foster families. Especially ones willing to take infants, large sibling groups, older children, and children with mental and physical disabilities. For younger children, the most pressing issue is childcare. The state subsidy doesn’t cover the current cost of daycare, nor address the challenge of securing last minute care. These days, most foster families in Los Angeles have two working parents, making affordable childcare an imperative to take in infants or toddlers (Chronicle for Social Change). LA County Supervisor Sheila Kuehl is aware of the problem. She proposed $31 million of funds to offer vouchers and assistance in obtaining emergency and sustained childcare for young foster children (89.3 KPCC). Sheila Kuehl has long fought for the rights of women and children, and foster children especially are lucky to have someone like her on their side. But, again… the real problem? So, how many foster families are needed in LA County? I couldn’t dig up an exact number, but in Orange County, Social Services pegged the need at 100-120 homes in 2016. Orange County has far fewer kids in foster care than LA – 2, 300 – most of them placed with relatives (OC Register). But even if it’s several hundred families needed in Los Angeles? That doesn’t seem like that many in a city with a population of 10 million. While we all consider becoming foster parents (or perhaps mentioning it to empty nesters/singles with space for a child? ), let’s see what else some very awesome people are doing to help. Together We Rise (TWR) is a 501(c)3 non-profit organization comprised of motivated young adults and former foster youth. Founded in 2008 by college student Danny Mendoza, TWR works with hundreds of foster agencies, social workers, and CASA advocates to aid foster youth across the nation. Together We Rise boasts an impressive list of donor partners – Jet Blue, Toyota, Goldman Sachs, Home Depot, Toshiba, AMC Cares, SoCal Edison and many others – attesting to the might and success of this incredible non-profit. TWR provides thousands of foster youth across the country with new bicycles, college supplies, scholarship money, and suitcases to travel from home to home. Additionally, they connect foster-adopt families with professional photographers to highlight foster-adopt success stories, dispel negative stereotypes, and encourage more people to consider becoming a foster parent (USA Today). I reached out to Danny and had the pleasure of meeting him in person, by helping TWR purchase video and sound equipment from our Samy’s Camera location in Hollywood. Danny’s an incredible guy – his organization’s combination of youthful enthusiasm and elbow grease is admirably inspiring. 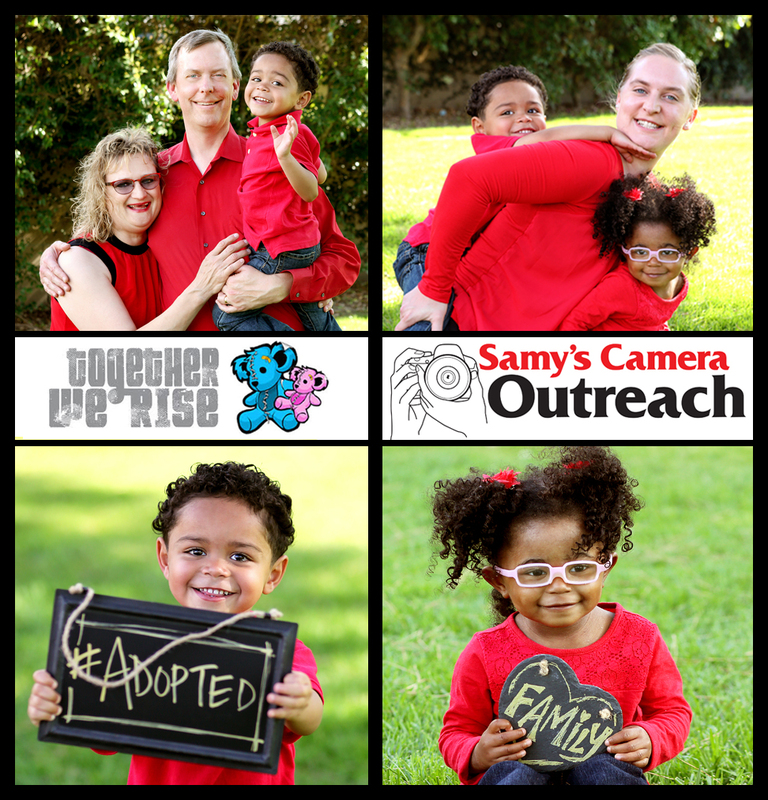 I’m proud to say Samy’s Camera Outreach is now registered as one of their photographers to take pictures of foster/adopt families—either to capture the official court day ceremony or an informal family photo shoot. Recently, I did our first photo shoot for a most amazing family. Lee and Marion have adopted eight children from the foster care system. They first foster-adopted a set of six siblings, school-aged and teens. It wasn’t easy, Marion says. Several of the older children, understandably traumatized, had severe behavior issues. 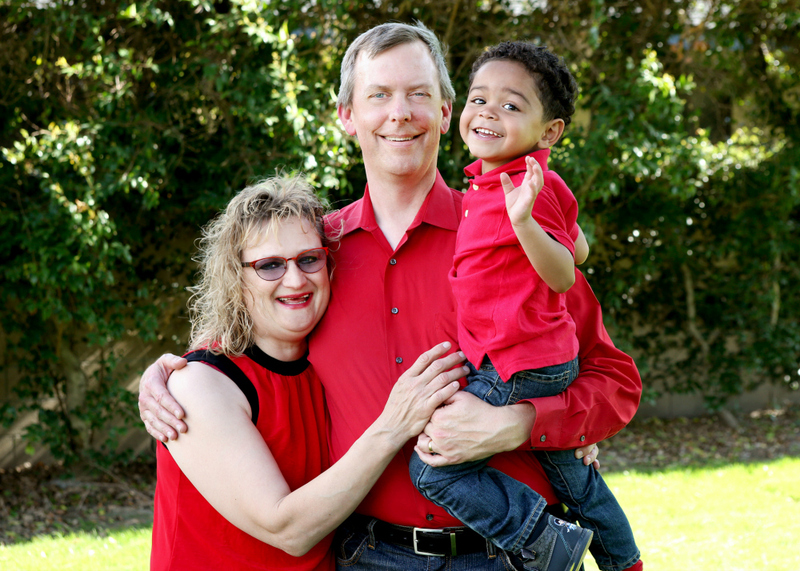 Their second time around, Lee and Marion decided to adopt an infant from foster care. They saw five infants come and go in the space of a year, most suffering from neonatal exposure to drug and alcohol abuse. Their son, the handsome 3-year-old in the photos, came to them after a similarly rocky start. But with the constant love and nurturing of Lee and Marion, he has grown into a healthy, happy, ADORABLE little boy. His adoption papers went through last December. Lee and Marion are now waiting on the finalized adoption of the 2-year old little girl, who’s also been with them since birth. Take a look at this beautiful family, who’s been through so much together, but are so lucky to have each other. The world is so very lucky to have people like them.